Warning! Danger! President Trump -- Naive, Incompetent or Trader? Trump has reportedly discussed withdrawing from NATO. That would be great for Russia. According to the New York Times, Trump brought up pulling out of NATO several times in 2018. President Donald Trump has reportedly suggested on multiple occasions that the United States withdraw from NATO — a maneuver that would roil the global community and signal a major victory for Russia. Julian Barnes and Helene Cooper at the New York Times reported on Tuesday that in 2018, Trump said several times that he wanted to remove the US from the North Atlantic Treaty Organization, a military alliance between the US, Canada, and multiple European countries signed in 1949 to contain Soviet expansionism after World War II. Trump announced the pull out of Syria. Russia made happily. Government shutdown. The longest in America's history. 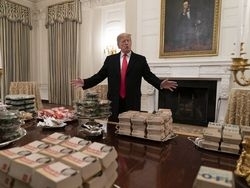 Tried to feed young Dems "junk food" to get them to change their house vote on shutdown. 1) Given that you follow the news as closely as you do, I'm surprised that you seem not to know that the issue with the speaker's safety was that the president publicly revealed the destination of speaker's planned visit to Afghanistan. Normally, trips into war zones by high government officials - say those high in the line of presidential succession, such as the speaker of the House - are kept secret to limit the foreknowledge of groups and individuals who might do those officials harm. 2) It's telling, I think, that among the list of six presidential sins CM presented, you took issue with just one. Perhaps you agree with many observers that confiscating translator notes, swearing those translators to secrecy, keeping details of diplomatic meetings secret from your own national security and diplomatic advisors, announcing an immediate - which won't be an immediate - troop withdrawal from Syria, and pulling out of NATO ARE bad, even dangerous, ideas? Obviously, any possible danger to which you are referring is totally irrelevant since the trip was cancelled. With a trip not happening, no danger of what might happen on the trip exists. Thus Mr. Trump did not endanger anyone's life in this matter ... those who accuse him of such seem to have forgotten that the trip was cancelled and make accusations as if details and secrets for an upcoming trip were revealed. What matters here, Wolfgang, is why the trip was cancelled. In his January 17 letter to Speaker Pelosi, the president postponed the congressional trip, so he stated, "due to the shutdown." It was Speaker Pelosi who then cancelled the trip in response to the security concerns the president created when in said letter the president identified the trip's planned stops (Brussels, Egypt, and Afghanistan). High government officials' trips to war zones are usually handled secretly (which is why we never receive advance notice of a president's trips to visit soldiers deployed in war zones such as Iraq or Afghanistan). The president's letter violated the long-standing practice of secrecy about such trips. For similar security reasons, obviously, the speaker's delegation was not about to accept the president's proposed alternative of flying commercial to Afghanistan. So of course there are no longer security concerns about a trip that has been cancelled. But the trip might have been merely postponed, not cancelled, had the president handled its arrangements - both schedule and security - appropriately. For the reasons I just stated, the president's revelation of the congressional trip's stop in an active war zone indeed revealed details that should have remained secret. @Bill_Coley said: For the reasons I just stated, the president's revelation of the congressional trip's stop in an active war zone indeed revealed details that should have remained secret. Once her trip was canceled it was no longer her destination. Therefore no safety was at risk. So don't be stupid. Actually I don't have a problem with the notes. That's within his right. Obama announced a withdraw from Iraq, was that a sin? I agree on pulling out of NATO. It's a bad alliance that is not to our advantage. Your idiocy is in play again. If the trip was postponed, it would not be the same trip and that future trip would be secret. Oh please. That's not reality, he's an idiot just like your stupid remarks make you one. Your reply offers mistaken logic reminiscent of Wolfgang's in his recent post in this thread. OF COURSE there were no longer security concerns once the congressional trip was cancelled. No one is arguing that security concerns survived the trip's cancellation. The issue rather is the cause of the trip's cancellation: the president's naming Afghanistan, an active war zone, as one of the delegation's destinations. Had he not broken with long-standing practice of NOT publicizing war zone visits of high office holders, the trip could have been rescheduled. 1) In his January 17 letter to Speaker Pelosi, did the president identify an active war zone as one of the destinations of her congressional delegation's trip? 2) Has it been standard U.S. government practice not to give advance public notice of high officials' visits to active war zones? Isn't that why presidential visits to U.S. troops in war zones are always "surprise" visits? If the trip was postponed, it would not be the same trip and that future trip would be secret. My point is the first trip should have remained secret. Actually I don't have a problem with the notes. That's within his right. 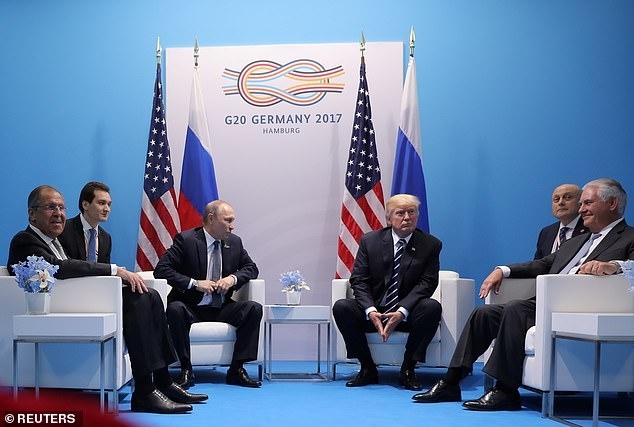 Whether the president had the right to take and probably destroy translator notes, and whether it was within his rights to keep from his national security team vital information about what he discussed with other foreign leaders, especially leaders hostile to American interest, is not the issue. The issue is whether it was right for him to do those things. Do you contend that it is in our national security interests for presidents to keep the content/agreements/etc of their meetings with other leaders secret, even from their own national security teams? Obama announced a withdraw from Iraq, was that a sin? As I'm sure you'll recall from history, President Obama decided to stand by the Status of Forces agreement negotiated by President George W. Bush, so, the planned withdrawal of American troops from Iraq by December 31, 2011 - again, agreed to by Iraq and the U.S. during the Bush administration - had been known for more than three years when it finally occurred. There was no such years-long advance notice of the troop withdrawals from Syria announced by President Trump. A sin? To my recollection, one of Mr Trump's and the political right's boiler plate critiques of President Obama's military policy was that he (Obama) announced what he was going to do in advance of doing it. Apparently Mr Trump and the political right believe Trump's troops in Syria withdrawal notice was a sin... unless of course Mr Trump and the right are being hypocritical... but that could never happen, could it? I agree on pulling out of NATO. It's a bad alliance that is not to our advantage. Revisit Article 5 of the NATO charter and the history of its implementation, then ask whether the NATO alliance has been to our advantage. The consensus among experts about the value of NATO to us and our national interests is as strong and complete as any consensus on any issue. I agree with that consensus and disagree with you. I try. I really do try! But sometimes I just can't help it. Your idiocy is in play again. For some reason, my idiocy really likes to play, especially "again." What about your idiocy? Ladies and gentlemen, we have a TWOFER!! "Idiot" and "stupid" in the same sentence!! In these threads, we call such eloquence a "DavidTaylorism," in honor of these forums' most celebrated and passionate proponent of idiocy- and stupidity-based criticism of other posters. Congratulations, reformed. You've earned a high honor. Yes on a trip that was no longer active. Yes. But the trip was canceled so no advance notice was given. Since those people serve at the pleasure of the President and nobody else, I don't have a problem with it at all. Personally I do not agree with the withdrawal from Syria. So no, it is not hypocrisy. I was merely pointing our the Left's hypocrisy on this issue. I know article 5. But let's be honest, how many times has that article been used to benefit the USA? Only once to my knowledge. First truthful thing you have said. I'm the only sane one between the two of us in this matter. Sometimes you have to call a pig a pig, a wolf a wolf, a snake a snake, an idiot an idiot. I can't help it if you are a liberal hack who has his head so far up his rear-end he can't see the light of day. Facts matter: In his January 17 letter to the speaker, the president both announced a change the congressional trip's postponement AND made public the fact that an active war zone was part of that trip's itinerary. It was the next day - on January 18 - that the speaker announced the trip's cancellation in response to the president's disclosure. That is, when the president made public the active war zone destination, the trip had been postponed NOT cancelled, and so yes, the president DID give advance notice of the war zone destination. Because it is long-standing U.S. government practice to keep secret the travel itineraries of high government officials who visit troops in active war zones. The issue isn't and my question wasn't about who serves at the president's pleasure. The issue and my question is about the national security interests of the United States. So, I'll ask my question again: Do you contend that it is in our national security interests for presidents to keep the content/agreements/etc of their meetings with other leaders secret, even from their own national security teams? And as I showed in my previous post, and you chose not to address, Obama's enforcement of the Bush-negotiated SOFA with Iraq is NOT the same as Trump's withdrawal of forces from Syria. Yes, one time: other NATO nations, for us after the 9/11 attacks. Never have we responded on behalf of a NATO ally via Article 5. But the strategic, security, and economics advantages of the NATO alliance are FAR more than just Article 5. Your point of view is in the distinct minority on this issue... with national security and defense experts, not just CD posters such as I. Tell the truth! The issue was our respective idiocies, NOT our sanities. Now get your snark straight, reformed! David would NOT be pleased that in the span of two sentences you morphed from idiots to hacks with stuffed rear ends. Why, even the snarkiest of juvenile name callers believes in message discipline. So should you. The trip as scheduled and planned was canceled via the postponement. She was never going to fly commercial. Quite honestly, I don't think it is the role of Congress to be making such ridiculous trips anyway. And it was until the trip was no more. Again, it's up to the President. I don't think it is wrong, nor do I have a problem with it. Economic advantage? Please. How much money do we WASTE on NATO? Don't care if David would not be pleased. I don't answer to him, or you for that matter. The fact is you are blind, ignorant, liberal lackey, idiot, bufoon, uneducated, stupid, outrageous, pig-headed, dumb, annoying, and any other number of adjectives. I was all set to applaud your expansive vocabulary, but then you had to include "liberal lackey," "idiot," and "buffoon" in your list of adjectives. (Spoiler Alert: They're nouns) Don't fear! Learning is a journey, not a destination. As for the other parts of your most recent post, here's another noun I hope you'll include on your learning journey: facts. See, I never said all of those things were adjectives. Facts matter. I have facts, you have twisted distortions of half-truths. Snake. Snake! An addition to the invective! Good job! No respectable juvenile name caller risks redundancy. I respect your creativity, reformed. "Enough is enough and too much is good for nothing". You have partially achieved, so far, what you set out to do. That is, to distract and/or tried to change the focus of the OP -- Mr. Trump, your failed, at best, failing President. So you see, your focus is not me, Bill any or any participant of CD. Other than your quest to take the focus off the immoral, childish, unhinged, nepotism and political chicanery of Mr. Trump imposing on America, I don't know why you seem to be so haunted. You sound like a man who's on his way out of the door, begging to be removed, have privileges severely restricted or terminated. May I say, this is not necessary. This is not being bold, manly, making your point or Christian. If it doesn't matter to you, it's an undeclared surrender to decency and moral light is fickling or has gone out in your soul. Please remember, your upbringing. I'm sure your parent or guardian person taught (or at least tried) you to respect your elders. I can't believe you're older than Bill. Behaving the way you do, I would find it hard to believe. Most older adults have better self-control. Season your posts with kindness and the love of Jesus. You don't have to say all of what you think or feel. Don't let your political views or affiliation influence your biblical interpretations or response. Let Christ love others through you. Would you like someone calling your father, brother, uncle, or friend the names you project on others? Even if do or think they deserve it, do you have to be a slave to your emotions? The God you profess to know, can He help you to behave better in these forums? No, what I set out to do is show you and Bill for what you really are. The President is doing a fine job, a commendable job. I don't really care about dignity. I am controlling myself. Targeted, calculated. You don't know anything about my upbringing or me in general. Which is why I must make it known who you two are. Jesus was not always kind was he? Oh trust me, I hold back quite a bit. I'm not. You however, are. Like I said, my behavior is intentional and calculated. The man has been posting and will continue to call out the snakes you are. 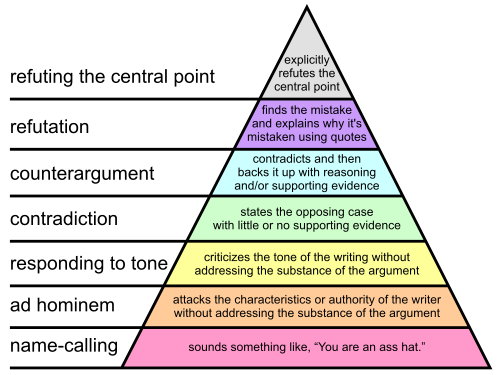 May I remind everyone please to use arguments from the top of the pyramid, and avoid the bottom ones, especially the two lower layers. They reveal more about the person using them than about the topic, and contribute nothing to the discussion. Once an argument has been torn down and their insanity continues to repeat itself the lower levels become necessary. What if he doesn't sign it? PS. Bill, please help those (politically impaired) who can't connect the dots. Thanks. A trader? Do you mean traitor? If so, I think you might be one of the politically impaired ones. That being said, I applaud Trump. Signing the bill AND finding money for the wall. That's a great move and completely legal. The National Emergencies Act, signed into law in 1976 and amended in 1985, empowers Congress via joint resolution to terminate a presidential declaration of national emergency. Because several Republican senators have recently voiced disapproval of a national emergency declaration in these particular circumstances, and because any joint resolution passed by the Democratically-controlled House will HAVE to be voted on by the Senate - i.e. leader McConnell will NOT have the power to hide the resolution the way, for example, he hid the Merrrick Garland Supreme Court nomination back in 2016 - those Senators will be forced to take a stand on what a strong consensus of experts AND the American public (66% disapprove in more than one recent poll) agree is a terrible idea. The president would of course veto any such joint resolution, but I predict by then the consensus against the action will strengthen and Congress will override the president's veto. It sure seems that Donald Trump believed presidents should not execute end runs around Congress. WhatEVER could have changed his mind?!! President Trump has been, is, and very likely will remain a disgrace and embarrassment to the office and our nation. In this particular case, I'm hopeful Congress will override and shut down the president's ill-considered, actually reckless and dangerous, power grab. This morning during his national emergency declaration press event, President Trump said he "didn't need to do" a national emergency at this time, and that he "could do the wall over a longer period of time," but decided to do one now, via a national emergency, because he'd "rather do it much faster." A question for @reformed and any other supporters of the president's action: Isn't an "emergency" by definition something that one "needs" to do right now? [When I sought Google's help for a definition, I found "a serious, unexpected, and often dangerous situation requiring immediate action."] What other kinds of "emergencies" allow such flexibility and discretion as to the timing of one's response? This is perplexing. I agree there is a national emergency, I do not agree that you could do a wall over a long period of time to address the emergency. A little puzzling. What judge who hears an appeal of the president's action isn't going to hear/read his confession from this morning and not conclude that the president made a national emergency proclamation under false pretenses - that he declared something to be an emergency that he believed actually wasn't one? The man as much admitted that the border is not an emergency! He told the nation that he could take a lot longer to build the wall if he wanted to, but he'd prefer to do it faster so he declared an emergency. What court is going to say, "It doesn't matter whether the president actually believes a situation is an emergency. What matters is only whether the president says it's one, even if he admits that what he said was false"? Partner today's fiasco with the fact that things at the border are demonstrably better today than they were when Trump took office (so why did he wait two years to declare an emergency?!) and the fact that Congress has acted and appropriated specifically on the wall issue, and I think you have an insurmountable challenge to his emergency declaration. It's now over and done with, I predict.